EDIT: 3.16.15 -- Thanks to everyone that submitted their links for this call for art! WOW! It'll take us just a bit to wade through all of the awesome entries - sit tight and we'll be announcing the final list of participating artists shortly! There are 88 modern constellations in the sky, suspended amongst incredible natural phenomena that shape worlds beyond our own. Billions of people have looked up at the night sky and wondered about their place in the universe. Oracles used the stars to predict events to come and constellations became beacons that could guide travelers across uncharted territory. The night is full of glittering reminders that we may not be alone in this universe. 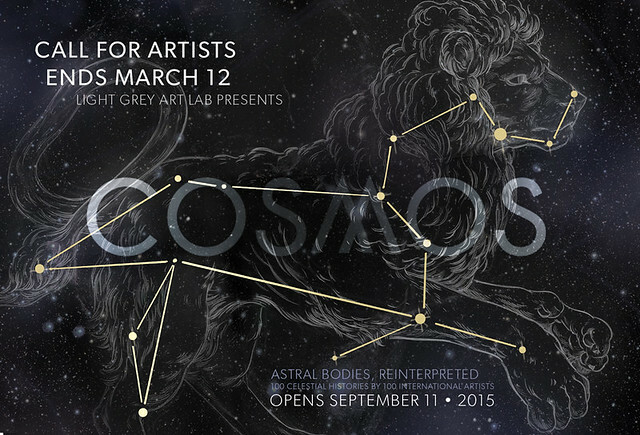 For eons the cosmos have held great significance in countless civilizations, and in the month of September, Light Grey Art Lab will turn out the lights and look to the skies. Let's recreate the magic of our universe together. From all 88 constellations and astral phenomena to the planets in our own solar system... We'll light up the night! We are looking for artists that want to look deep into the astrology, the mythology and the metaphors that have shaped our knowledge of each of these stellar bodies. Each artist will receive one of the 100 astral bodies at random and a template showing it's position in the sky. We'll cover the gallery with an incredible maze of illuminated beasts, gods, stories and legends and we'll let viewers experience the ties between what we actually see at night, and what we see in our minds eye. And to top it all off, we will be printing a limited edition astrological oracle deck to accompany the exhibition -- where you'll learn how to chart your own astrological influences, intuit messages from the alignment of the stars, and divine wisdom from the Cosmos themselves! We are planning all sorts of star-gazing activities leading up to the opening reception including some really incredible experiential get-togethers centered on the sky. More details about our schedule of extracurriculars will be posted soon! So! If you'd like to be in charge of shaping our universe as we know it, put your name, links to your work and your email below by March 12th! A full participating artist list will be posted in the week following the close of the call for art and an email with dates, constellations and astral bodies and specifics about the show will be provided to everyone soon after! If you have any questions about participating, please feel free to send a note and we'd be happy to help answer your questions! Thanks and please help us spread the word! Questions? Please send us a note at hello@lightgreyartlab.com!